For most companies looking to expand the room in their warehouse facility, the mezzanine platform will have a distinctive purpose to that facility. 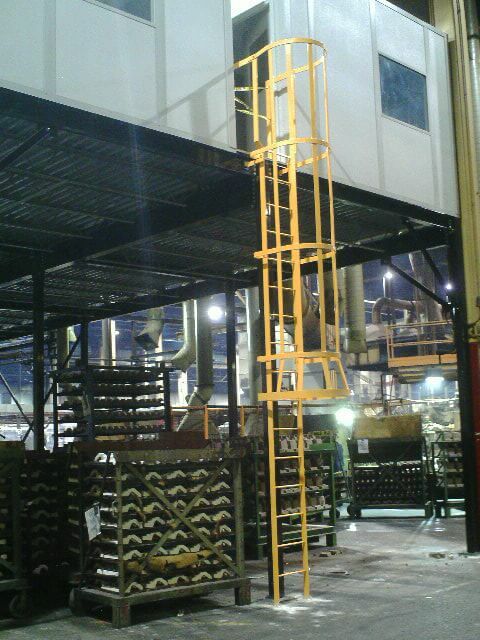 Whether the structure will function as a work platform, storage area, or if it is going to hold equipment, it will require different specifications and features in order to function properly. A mezzanine in an area with heavy foot traffic may need more safety features, or a storage platform could require a vertical reciprocating conveyor to move inventory back and forth. All in all, there are many ways to optimize your mezzanine to fit all of your unique needs. Panel Built mezzanine and storage platforms will provide you with a number of different hand railing options to best fit your application. Depending on the use of your warehouse mezzanine system, you may have certain regulations or codes with which to build your mezzanine. If your mezzanine is open to the public or is in an area with high traffic, there will be higher more strict building codes placed on it. In these high traffic areas, IBC railing provides rails of 42” high and 34” high on both sides of the mezzanine’s stairwell. While OSHA standards require railings on open sides of the stairwells and a handrail on a side, preferably the right side descending at 34” high. For all facilities, safety is one of, if not the most important rules. Barrier railing, also known as safety railing, provides you with some extra assurance, especially in areas with heavy forklift traffic. The Barrier railing is constructed of high strength steel and is designed to withstand heavy impacts. When placed around the columns of your warehouse mezzanine, the railing will help prevent damage to your recent investment. 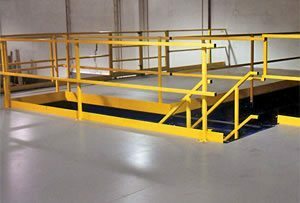 For mezzanines used as storage platforms, safety gates provide you with a secure option to safely move inventory on and off the level with ease. 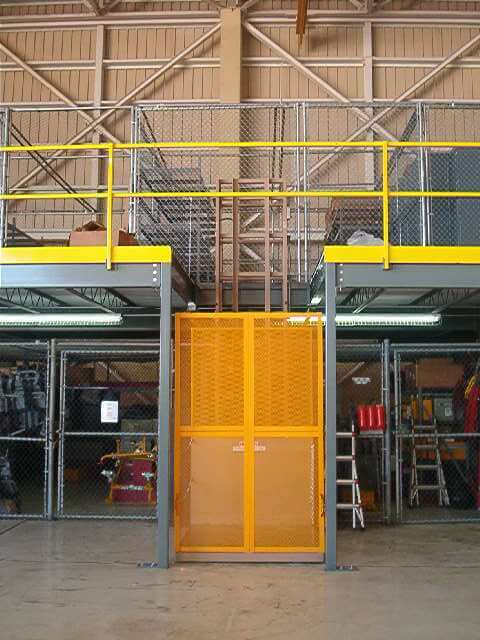 The main benefit of pivot gates is their ability to always have the mezzanine closed off from the facility floor. The gate’s arms will only allow one side of the gate to be open at a time, protecting your employees. This safety net allows for your facility workers to operate the gate and transport inventory with peace of mind. Panel Built also offers a number of additional gate options for your mezzanine. 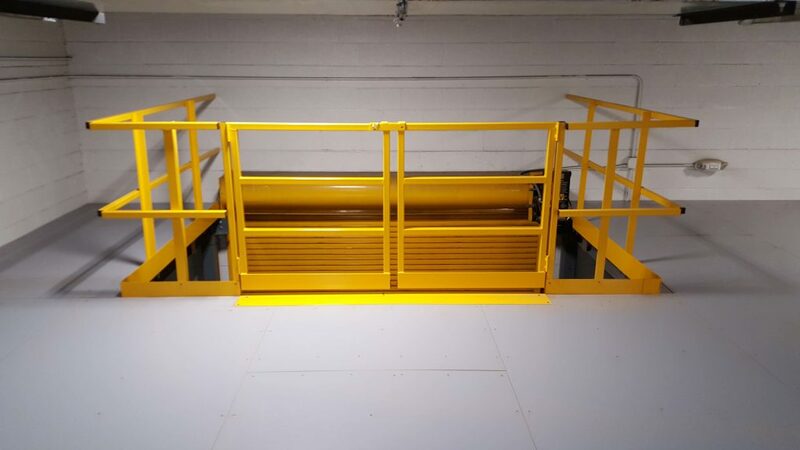 Swing gates, lift out gates, and slide gates allow for extreme convenience while moving inventory, just having to push the gate open or remove a section of the mezzanine railing. Many companies take advantage of the extra space a warehouse mezzanine provides by creating a locker room like environment underneath the structure. The wire partitioning allows for you to keep a visual on the contents of the storage unit, while still keeping them protected. With an up against the wall mezzanine, the wire lockers can be placed against the wall, occupying all the vertical space between the warehouse floor and the bottom of the mezzanine deck. This provides you with maximum storage space, while only taking up minimal room on the warehouse floor. Similar to an elevator system, a vertical reciprocating conveyor travels up and down to transport objects from one level to the next. However, unlike an elevator, a VRC is not constructed for human transportation, but strictly inventory and goods. This conveyor system offers the quick and convenient transportation of goods from your mezzanine level to your warehouse floor, without the use of a forklift. No matter what inventory needs to be transported, the VRC allows you to move it in the easiest and most consistent way possible. Your VRC can even include added features in order to perfectly fit the need of your warehouse. We can add additional railing, chains, or wire mesh to the sides of the platform in order to ensure the greatest safety measures possible. These conveyor systems provide the most benefit to your warehouse mezzanine system when it is being used as a storage platform, rather than an equipment or work platform. In many situations, warehouses or manufacturing facilities need to add an office area to provide a controlled and calm work area away from the warehouse floor. In these instances, a warehouse mezzanine can be the perfect structure to place a modular office on top of, or underneath it. The benefit of adding a modular office to your mezzanine is, of course, that you do not have to take up any unnecessary space on your facility floor. This type of office is perfect for a supervisor type, who would need to have a workspace overlooking the warehouse floor. It can also be manufactured to reduce noise, creating a calmer working environment away from the facility. For this reason, a modular office on a mezzanine is one of our most popular modular construction options for its convenient location and its ability to keep space free on the warehouse floor. Depending on the purpose of your mezzanine, using a ladder system as your main entrance could provide your warehouse with certain benefits. If the mezzanine system is going to primarily be used as a storage or work platform, a ladder system could be a viable option, or if combined with a pivot gate or VRC, they would even work with a storage mezzanine. The main benefit of utilizing a ladder in place of a stair system is that the ladder system is going to take up less area on your warehouse floor. If your mezzanine system needs to maximize its total usable area, the ladder system would best allow you to accomplish that. However, with the ladder system, more safety precautions must be taken. For this reason, most companies will use a caged ladder to reduce the chance of employee accidents or if a worker does fall, they have a chance of catching themselves or pinning themselves against the ladder’s cage. The most common of our warehouse mezzanine decking options, Advantech is a high-quality flooring material that has properties similar to plywood and Oriented Strand Board. However, it provides advanced strength, stiffness, and moisture resistance. This type of decking is considered the most economical option of the materials that we offer. Similar to our Advantech option, ResinDek provides a higher density composite flooring recommended for mezzanines require a solid floor, subject to heavy loads from the use of pallet jacks, carts or dollies. This option is typically installed over 20g corrugated steel decking and has a load capacity of up to 2000 lbs. Its surface is skid resistant and easy to clean. 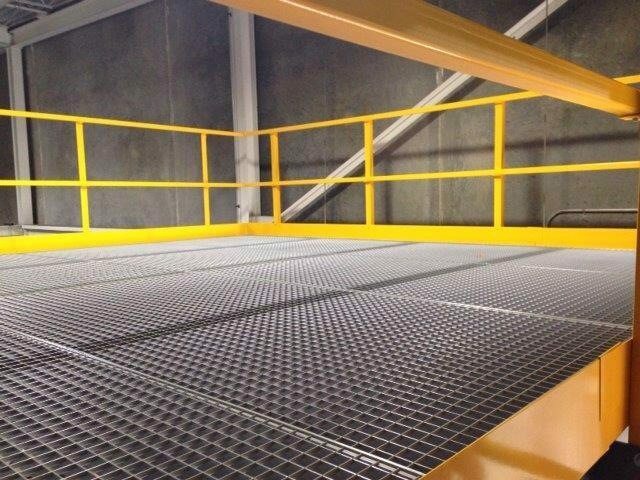 If durability is a serious factor in your warehouse mezzanine decision, you may want to consider a diamond plate floor. Heavy duty steel tread plate (diamond plate) is generally installed over Advantech. Advantech is mounted over corrugated steel deck to provide greater durability with higher point load and wheel load capacities. It also enables a quiet floor for the work environment as opposed to having diamond plate directly over a steel deck. If you are looking for the most durable decking option possible, concrete should be your first choice. With a high point load and minimal transmission of noise through the deck, concrete should be used in high capacity industrial and military applications where the mezzanine is considered to be permanent. Overall, when taking all of these options into consideration, you should be able to design a warehouse mezzanine system with all the accessories to perfectly fit your facility’s needs. The most important aspect of the entire project is understanding how your new mezzanine will fit in your facility and your facility’s work processes. If your mezzanine is functioning primarily as a storage platform, a gate or vertical reciprocating conveyor may be all you need to fit your facility. However, more intricate designs and more unique purposes may require a combination of these accessories. Ultimately, if you can dream up your own perfect warehouse mezzanine system, we can help you build it. and get your Modular Project started!